The Foxtail Agave (Agave palmeri) is a tough drought-tolerant succulent that is native to the southeastern United States and Mexico. It forms a striking feature in any garden with its large rosette of long fleshy spine-tipped leaves. Its waxy leaves prevent evaporation, and allow the plant to collect moisture and roll it down to the extensive root system below. The Foxtail Agave is monocarpic, blooming once before dying. In the last year of its life, it produces a long flowering stalk with pale yellow flowers from June to July. After blooming, the main plant dies but is propagated by plentiful seeds and rhizome suckers. The Foxtail Agave grows to a height of 1.5m, with a spread of 1m. It has a slow growth rate, taking up to three years to reach its mature size. Requirements: Grows in full sun, or part shade. Requires well-drained sandy soil. Water usage: Requires no watering once established. 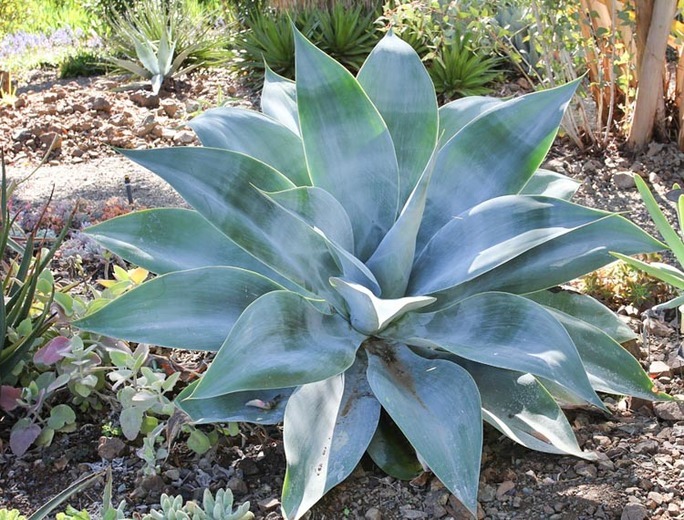 Appearance: The Foxtail Agave is an evergreen succulent. It has stiff blue-green leaves with spiny edges growing in a dense rosette. During the last year of its life, it produces a single flower stalk up to 4.5m long with pale greenish yellow flowers. After blooming, the main clump dies producing suckers that grow into new plants. Notes on use: Accent plant; good in rock gardens and in pots. Potted specimens will be smaller in size. Care should be taken not to plant Foxtail Agave too close to walkways, as spiny leaves may cause injury. Propagation: Propagates by seed or suckers. Maintenance: The fierce leaf tip may be clipped off, taking care not to cut too far into the leaf to prevent leaf shredding. Dying leaves at the base may be cut close the trunk to keep the plant tidy. Notes: Native Americans used the plant’s leaves as a food source, and used leaf fibers to produce ropes and baskets.